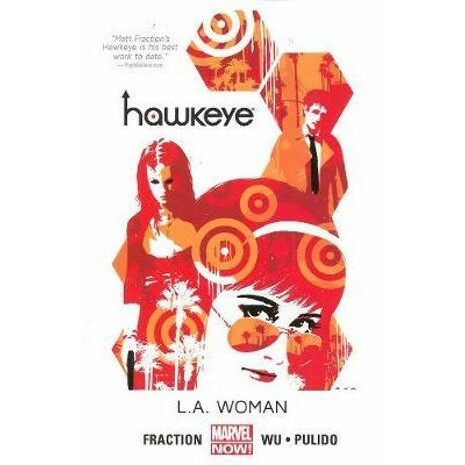 Kate Bishop heads to Los Angeles to get away from New York, life, and Clint Barton - but not away from trouble! Because Madame Masque is hanging out at poolside with the rich and famous as well! As Kate helps a reclusive and Sixties-damaged pop music genius find his lost masterpiece, Madame Masque finds Kate. By which we mean starts trying to kill her again. Matt Fraction, is an Eisner Award-winning American comic book writer, known for his work as the writer of "The Invincible Iron Man," "The Immortal Iron Fist" and "Uncanny X-Men" for Marvel Comics and "Casanova" for Image Comics.